MSD Passwords is a secure and easy to use password management software, designed to help you to navigate to websites protected by password, using the default browser of your computer. You will never need to recall dozens of user names and passwords to visit your favorite websites. Just recall one user name and password to enter the program and you will be ready. If you do not like to save protected websites passwords in your browser, MSD Passwords is for you. Once you get used to navigate the Internet with this program, you will never look back. Having strong passwords is a necessity of today’s world, but this can become a headache when you have to manage dozens social networks, emails and video steaming services. Many people use a single strong password on many different accounts, but that is not secure, and remembering different passwords for each different account is also impossible. That is why password manager tools came into existence, to help you manage all your different passwords easily. MSD Passwords is a lightweight yet powerful application, designed to help you store and secure all your passwords and accounts in one secure application. It lets you browse the internet securely and access password protected websites using your default browser. The installer size is ~6MB and the applications takes around ~20MB space on your drive once installed. The installation process is simple and straightforward, taking no time at all to complete. Launching it for the first time, you first need to activate the application using the license code. At startup, it asks you to create a password to lock down the application so no one can access it without the password. The application also supports locking itself down if left inactive for a certain amount of time. The UI of the application looks old, cluttered, and not pleasing to the eyes. You can change the colors and font of the different section of the UI though, to make it look a bit appealing. At the top is the menu bar with usual drop down menus, followed by a toolbar. It contains buttons like Protected Sites, Navigate and minimize, Navigate, Aux. DBs, Options, and Exit. You can configure your various password protected online services right away by editing the default sites or by creating new services and adding them to the data base. You can adjust the settings and tweak different options too. Moreover, there are different skins too that you can apply and change the look of the UI. – The UI comes with many different skins, and you can also change the font and color of different sections of the UI. – You do not have to remember user names and passwords to login to your favorite sites any more. The application does that for you. – The application can be locked down using a password, and you can also set it to automatically lock after inactivity for a certain amount of time. 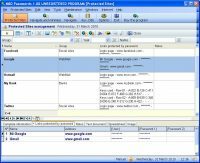 – Auxiliary databases allows to manage the Groups database, used to categorize the protected sites. – Search function makes it easy to find a specific password if you have lots of them. – Quick tutorial, integrated in the program help. – Not as user friendly and easy to use as other applications of similar category. – Lacks many features that other password managers offer, like browser extensions etc. MSD Passwords is a simple yet reliable password manager application. It can be difficult to use and understand at the beginning, but once you get used to it, you won’t be having any issues. The application runs smoothly without any lag or crashes. It is worth trying.